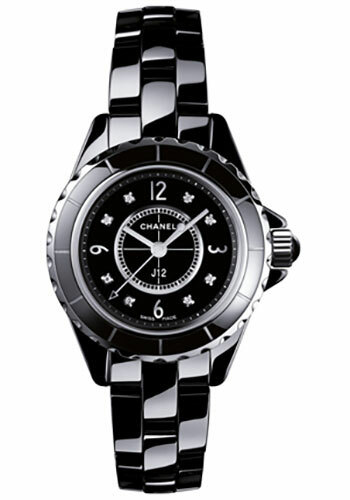 29mm black ceramic case, black dial with white diamond hour markers, quartz movement, black ceramic bracelet. 29mm black ceramic case, stainless steel bezel set with 40 white diamonds, black dial with white diamond hour markers, quartz movement, black ceramic bracelet. 29 mm black ceramic case, screw-down crown, steel bezel, black dial with numerals, quartz movement with hours, minutes, seconds, ceramic and steel bracelet, triple-folding buckle. Water resistant to 50 meters.